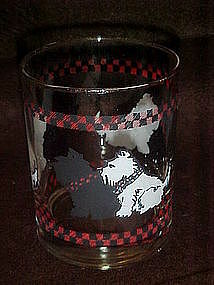 Here is an adorable scotch whiskey glass with a little black scotty and a white scotty dog. Red and black plaid border. Measures 4 1/8" tall. Thick bottom. I'm not sure if these are the scotty's from the black & white scotch whiskey or not. I actually have 2 available, and price is for each. Both are in excellent condition and have bright crisp colors.